It is the third week in November, the weekend before Thanksgiving. 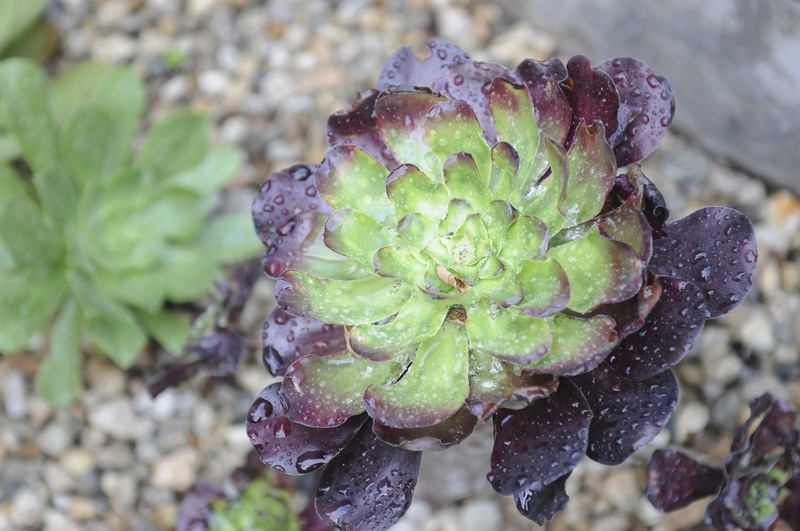 There has been a remarkable change in the gardens in the last few days. A few cold fronts have blown through and, like a light switch being flipped on, the splendors of fall have arrived. 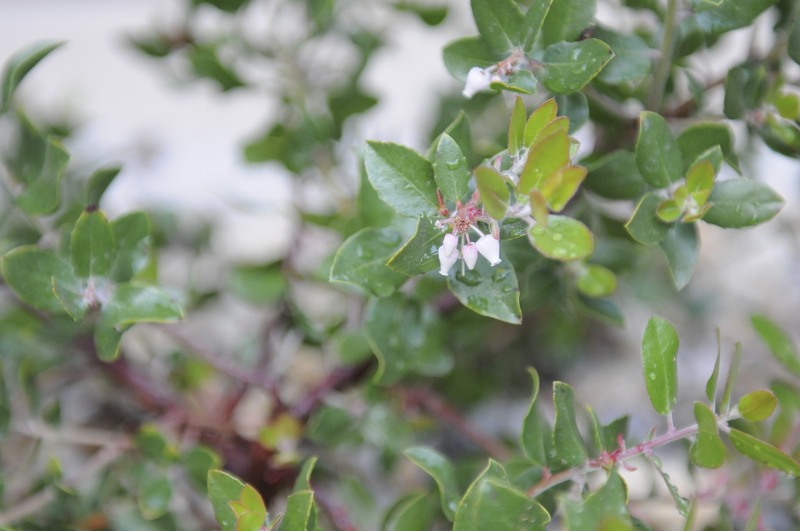 Pyracantha coccinea (Scarlet Firethorn), a native to SE Asia which is a squatter on our property (i.e., not planted, volunteer), and Heteromeles arbutifolia (Toyon), a drought-tolerant California native shrub (that will become a tree if you let it), have been show-stoppers this month. 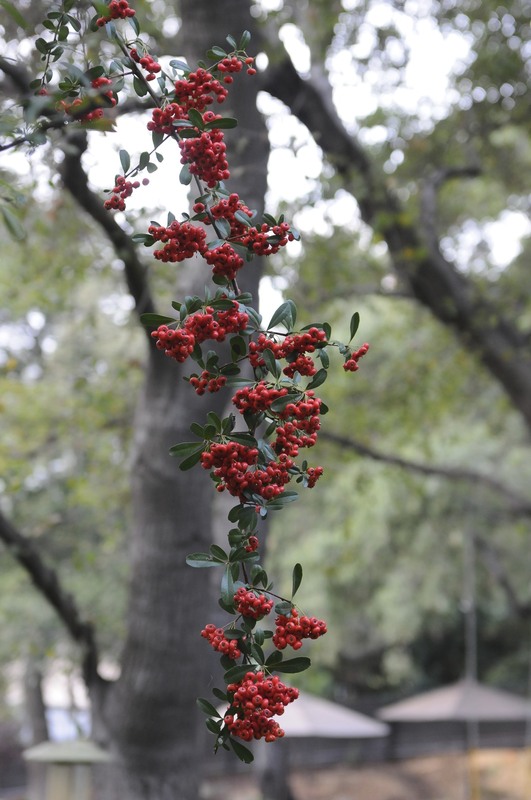 In early November, they began to bloom, with the Toyon demonstrating why it is sometimes also referred to as Christmas Berry. 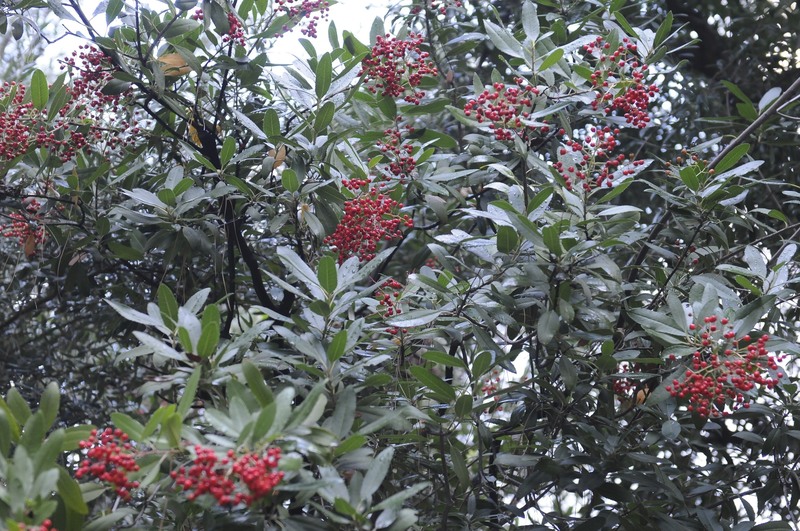 The Firethorn is first below, and Toyon follows. Both are in a shady area under a canopy of Olea europaea (Olive). Each is approximately 15 feet in height. 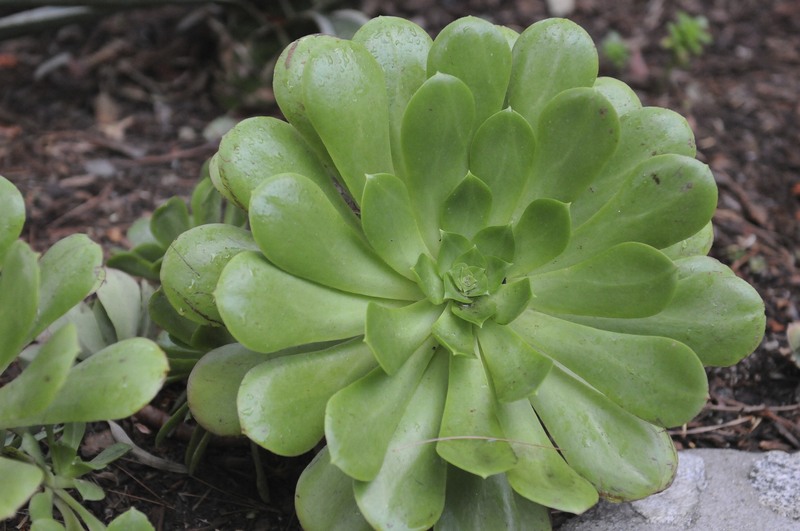 One of the Echeveria subrigida apparently thinks it is summer and has begun sending up a flower. 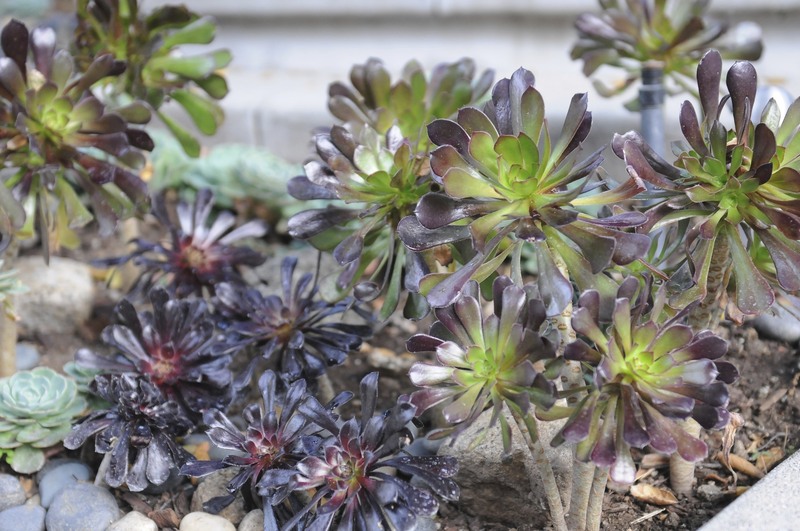 The Aeonium in the gardens seemed to have awakened in early November. The Ceanothus ‘yankee point’, a California native wild lilac, continues to show new growth. 2 to 3 months until they bloom (we think)! 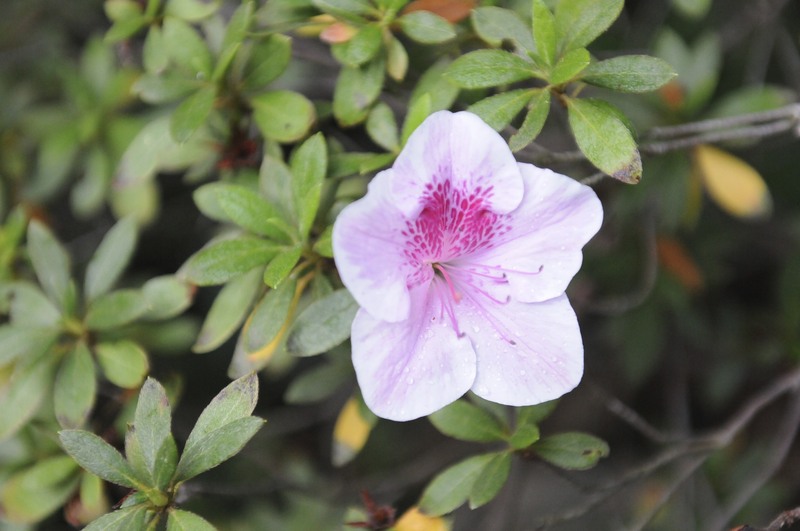 We are not certain of the species of this Rhodendron (Azalea), but it will be temporarily known as ‘November Beauty’. This grows in the shade under the Olea europaea. As mentioned in October Observations, the manzanitas are beginning to bloom. 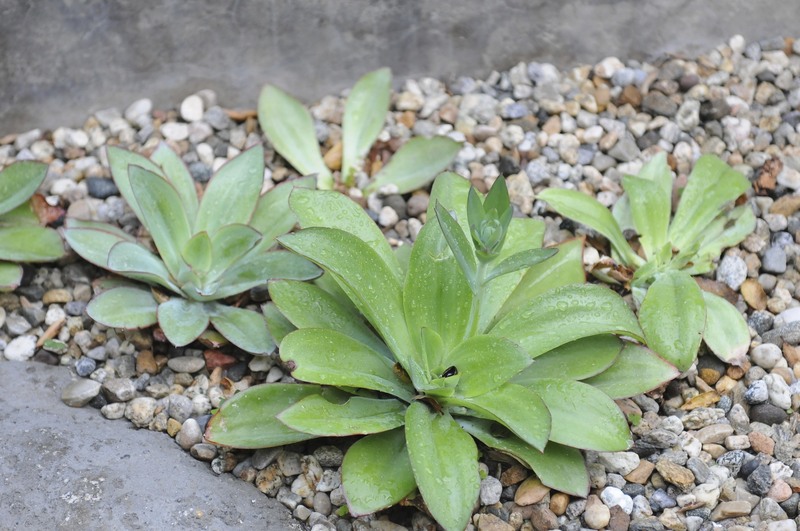 First was Arctostaphylos viridissima. This month, Arctostaphylos ‘Sunset’, a California native manzanita, is showing its beautiful urn like flowers. 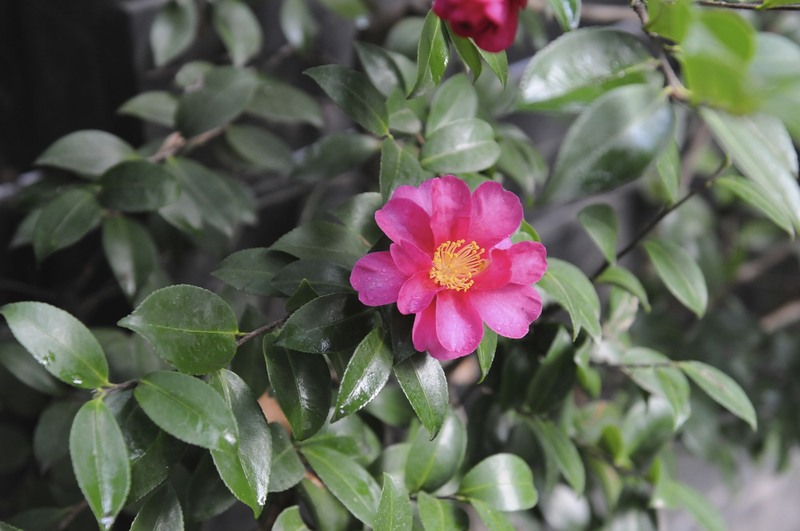 A Camelia that was here when we arrived, and which we can’t get ourselves to replace, proved her worth with this display of flowering. 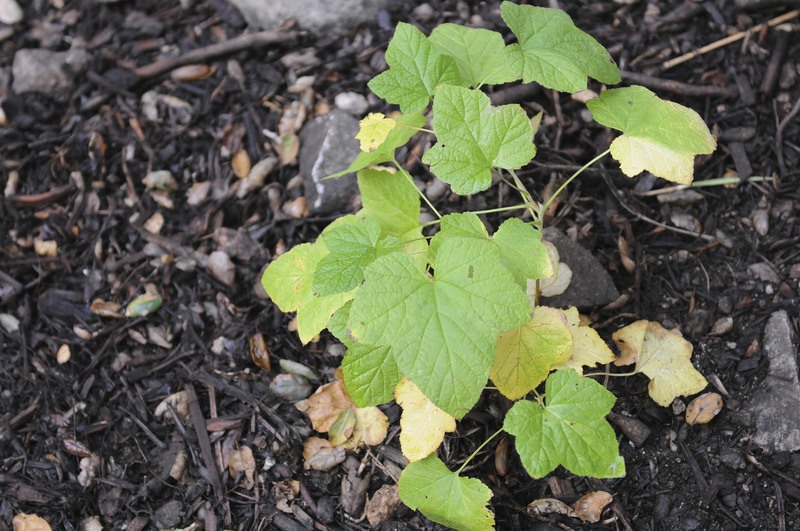 We recently planted a grove of Rubus parviflorus (Thimbleberry), a California native woodland plant. The oldest Coast Live Oak on our property offers it needed shade. 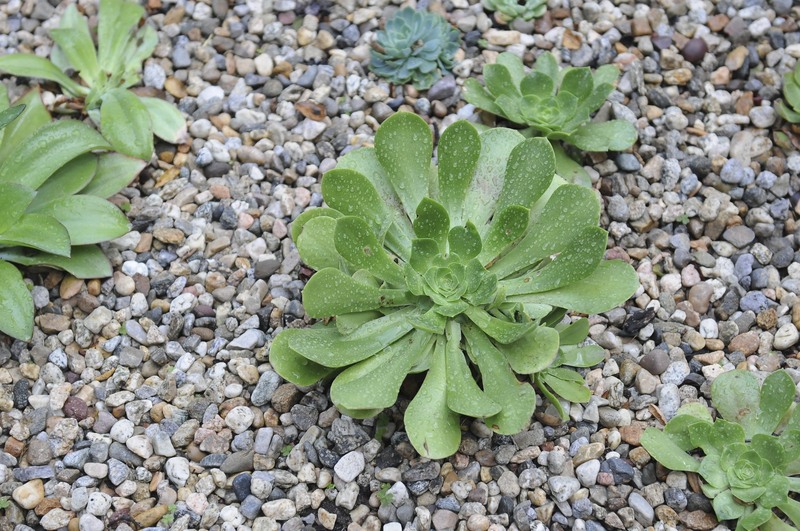 We love this plant for among other reasons — it reminds us of Oregon. 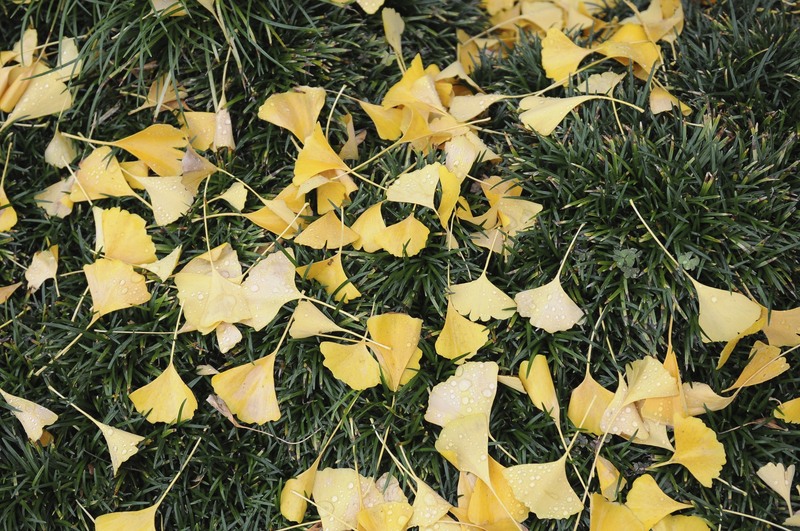 The yellowing of its leaves, as it prepares for winter is a wonderful offering of nature — even if it will soon be nothing more than stems with no leaves. 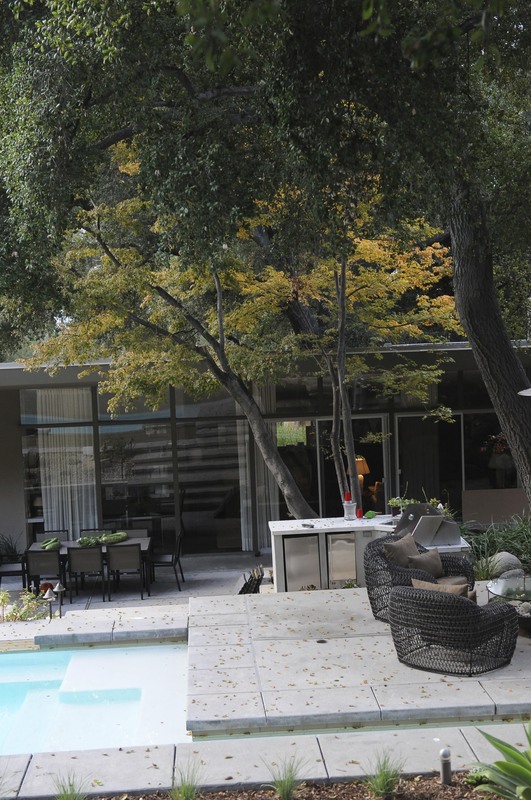 An old Acer palmatum (Japanese Maple) reminds us each year why our gardens will never be entirely composed of California natives. Although the height of its colors are not yet here in our gardens, this offers a glimpse of things to come in the next few days. 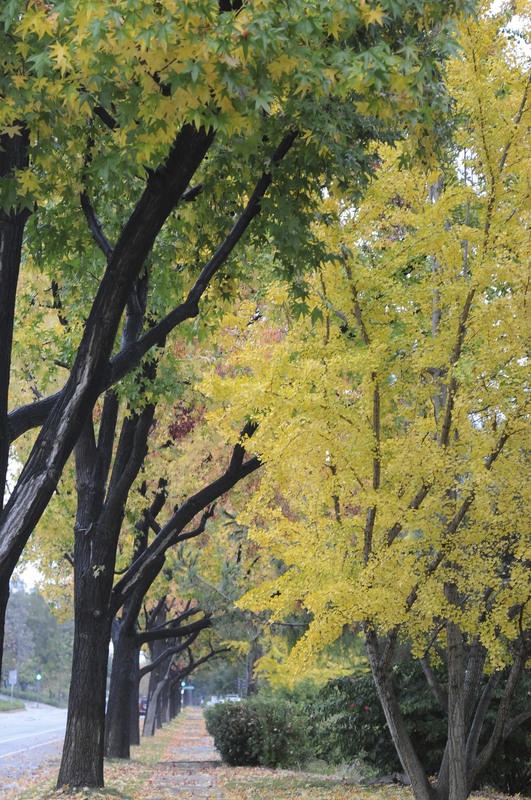 And from in and around our neighborhood, we are reminded of the magnificence of Ginkgo biloba and Liquidambar (taken on a rainy Sunday afternoon). 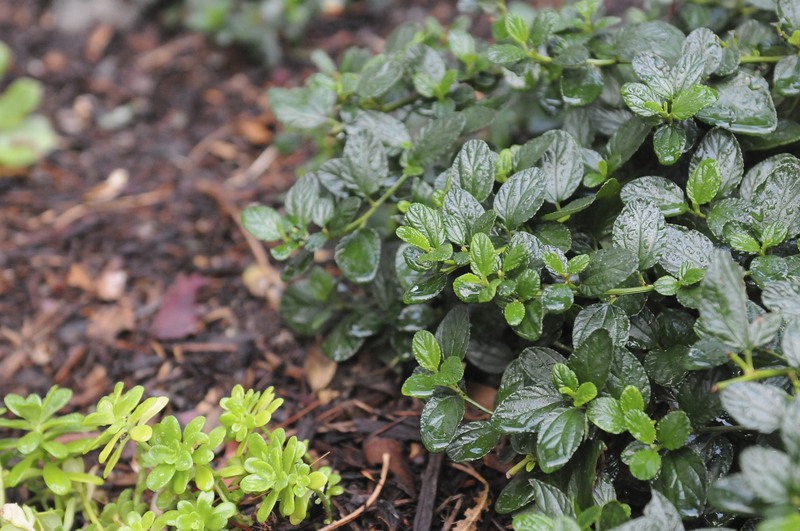 Michael, I enjoyed this post for your mix of telling and showing about your gardens. 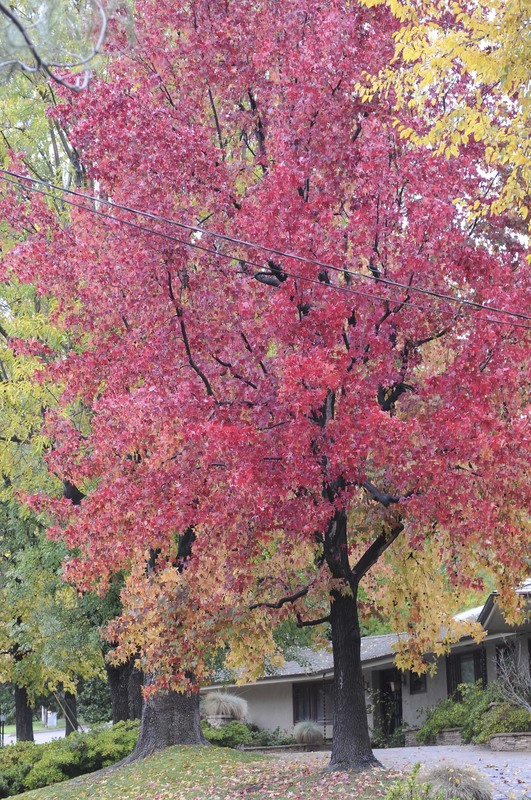 You have a knack for literary painting with phrases like “…The yellowing of its leaves, as it prepares for winter is a wonderful offering of nature.” Well done.